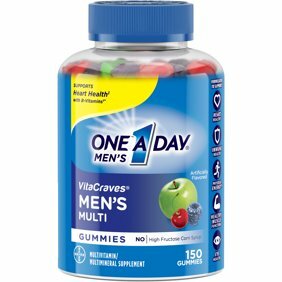 One A Day Men's VitaCraves Multivitamin Gummies, Supplement with Vitamins A, C, E, B6, B12, and Vitamin D, 150 ct. Ingredients: Other Ingredients: Cellulose Gel, Maltodextrin, Croscarmellose Sodium, Magnesium Stearate. Instructions: Suggested Use: Take one tablet daily with a meal. For easier swallowing, take with water before and during ingestion. Keep bottle tightly closed. Store in a cool, dry place, out of reach of children. Take one (1) tablet daily with a meal.